There’s no doubt that the November elections are an important matter and there’s one demographic that all are keeping a watchful eye over—the millennials—even more so, the minority voting millennials. New York native, former Hillary Clinton surrogate, and minority millennial herself, Maxine Outerbridge, is especially committed to seeing millennials show up to exercise their right to vote and has an urgent message for all millennials in the U.S. Surrogate? What’s That & How Did She Become One? Before we dive into the important message though, let’s clear a couple of things up. If you are unsure what a surrogate is and their role, I’ve got you covered. If you’re wondering how a young black female became so heavily invested in the Clinton campaign when Bernie was the crowd favorite, I have that answer for you, too. Outerbridge identifies a surrogate as someone who speaks on behalf of the candidate, which typically involves speaking publicly or publicly supporting the candidate. A few weeks later, Outerbridge received a call from Clinton’s campaign asking to meet her and her children to do a short feature. One thing led to another and she kept getting more and more involved with the campaign. After Clinton met Outerbridge, her kids, and other members of her family, they hit it off and she was unofficially aligned as a surrogate. The campaign called on her as needed for various engagements with close attention on mobilizing the vote of women, people of color, and young people. She did several speaking engagements with the campaign, most of which addressed topics such as women’s health, healthcare, minority issues, and millennials. As a surrogate, Outerbridge was featured in several volunteer initiatives and helped to organize events for millennials, all while frequently participating in media features, radio ads, and podcasts. 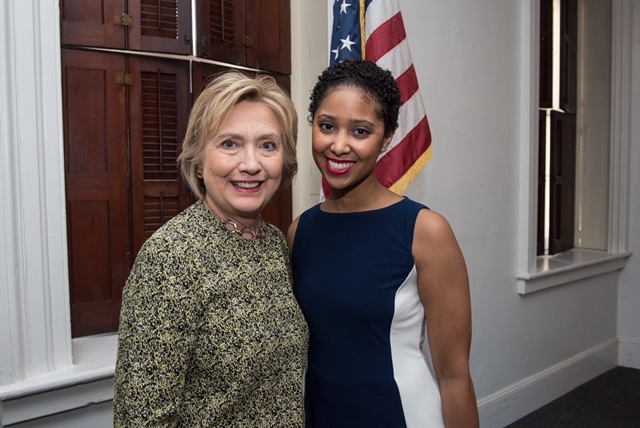 In addition to these campaign commitments, Clinton chose Outerbridge to be the youngest delegate representing New York at the Democratic National Convention (DNC), which allowed her to personally vote for Clinton as the Democratic Party’s nominee. Outerbridge was also Clinton’s special guest at the first presidential debate where she sat in the front row next to Mark Cuban. Outerbridge admits to being a little traumatized after the 2016 elections, noting that she doesn’t really work with the party directly anymore but is still committed to spreading important messages. She believes that it is imperative that all stay informed and especially go out and vote. Maxine Outerbridge can be found on Instagram sharing motivational musings and insights on mental health. The post An Urgent Message For Millennials From A Former Hillary Clinton Surrogate appeared first on Black Enterprise.